Raul's Rant: What Was Rob Gronkowski Thinking? 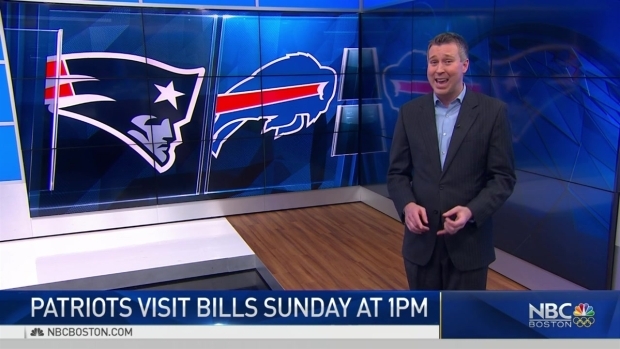 NBC Boston sports anchor Raul Martinez discusses the Patriots-Bills game. Not that the game was ever in doubt, but the Patriots performance over the first 30 minutes on Sunday afternoon left lots to be desired. So it was keen halftime adjustments that propelled the Patriots to a 23-3 victory over the Buffalo Bills for their eighth consecutive win. New England is now 10-2 on the season with a four-game lead in the AFC East with four games to play. The Patriots failed to score a first half touchdown for the first time this season, none of their four first half drives breaking through for six. Stephen Gostkowski’s leg was responsible for the Patriots holding a 9-3 lead at the break, at which point Tom Brady was 8 for 14 passing with just 96 yards. Brady didn’t have much time to work with in the pocket, either, as he was sacked three times and hit a fourth. Sure enough, the MVP frontrunner engineered back-to-back touchdown drives at the outset of the third quarter to put the game away and drop the Bills to 6-6. NBC Boston sports anchor Raul Martinez offers his preview and pick for the Patriots-Bills game. Though he didn’t throw for a touchdown pass on either series, Brady’s accuracy was much-improved in the second half thanks to more time to throw. The offensive line kept Brady upright for the entirety of the second half as he completed 13 of his 16 throws for 148 yards, although he did throw an interception in garbage time. Rob Gronkowski had nine catches for a season-high 147 yards, six of his catches coming in the second half. Gronk’s big plays blended perfectly with dynamic games on the ground for Dion Lewis and Rex Burkhead, who combined for 165 yards on 26 carries. Burkhead scored each of New England’s touchdowns in the third quarter, first on a 1-yard burst and the second on a slash-and-dash 14-yard run. Lewis and Burkhead each broke off one run of extended length to pad their totals, with Lewis gaining 44 yards on a run in the first half and Burkhead adding a 31-yarder. Lewis finished the day as the team’s leading rusher with 92 yards, the second-highest single game total for a Patriot after his 112 yards in last week’s game against the Dolphins. In his first game back in Buffalo after signing with the Patriots as a free agent in the offseason, Stephon Gilmore taunted Bills fans with a reminder of the skill set he possesses. As part of a last-ditch effort to get back in the game, Buffalo had first-and-goal from the New England 7-yard line with 9:26 to go in the fourth quarter. Nathan Peterman, who took over for an injured Tyrod Taylor, had two of his next four passes broken up by Gilmore – including a perfectly-thrown ball to Zay Jones in the end zone on fourth-and-goal from the 1 that ended any chance of the Bills coming back from 20 points down. Gilmore wasn’t the only former Bill to shine brightly in the game. Eric Lee, signed off of Buffalo’s practice squad on Nov. 21, had two sacks and an interception against his former team as his baptism by fire continues to pay dividends. His interception was a backbreaker for the Bills, which had driven 66 yards on 13 plays to begin the game after receiving the opening kickoff. Alan Branch pressured Taylor into throwing early, where Lee was perfectly positioned to come up with the errant pass. Lee, 23, now his three sacks in his first two games as a Patriot, the first three of his career. The 2016 undrafted free agent may be hanging around here for the long term. The Patriots have given up just 11.9 points per game over the course of their eight-game winning streak, with today’s output their best of the season. Buffalo’s hodgepodge of Taylor, Peterman and Joe Webb definitely did their collective part to help, the trio combining to complete only 15 of 34 passes for a paltry 85 yards. Their combined passer rating came in at 40.7, far and away the worst against New England this season. The Patriots will face the Bills again on Christmas Eve in Foxboro at 1 p.m., at which point it’s likely the AFC East will be all locked up for New England. The Patriots will continue their three-game road trip with their lone appearance on Monday Night Football this season next week against the Miami Dolphins at 8:30 p.m. on Dec. 11.